We have recently completed a unique Maritime & Coastguard Agency (MCA) search and rescue installation in Hampshire’s Solent Daedalus Airport. 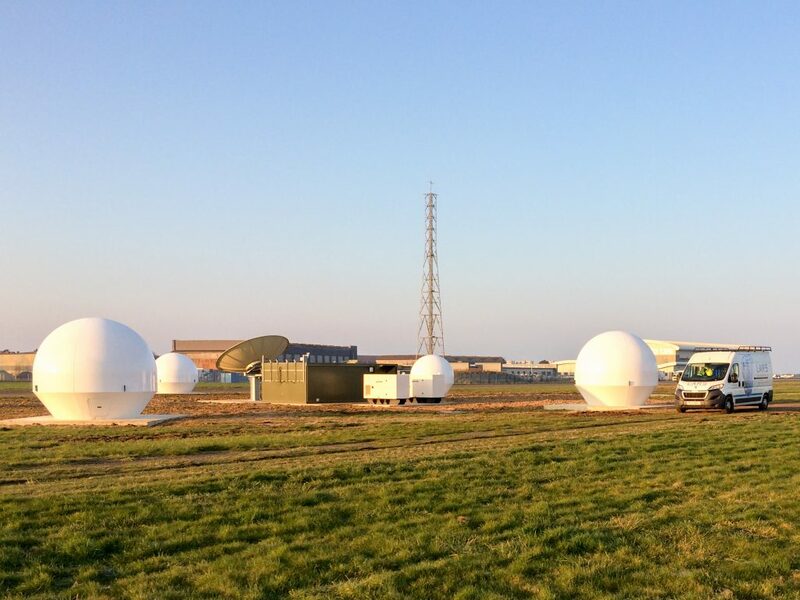 The installation, which comprises six Medium Earth Orbit Local User Terminal (MEOLUT) domes, is the only one of its kind in the UK, and one of only seven in the world. Developed by McMurdo, the MEOLUTs are state-of-the-art systems for receiving distress beacons, and will provide the MCA with near instantaneous detection of distress beacons and rapidly resolved location of the beacons using “single burst” processing. We assumed the role of principal contractor for the Maritime & Coastguard Agency project, where we worked alongside other specialist companies on the installation, including McMurdo, a company which is widely recognised as the most trusted name in emergency readiness and response. The domes, which are four metres in diameter and sit on a base which is five metres square, are located equidistant from a centrally positioned ‘GEOLUT antenna’, a five metre dish in the middle of the domes. In total, we installed a GEOLUT, a MEO/LEO antenna and six MEOLUT antennas. This was a huge project which included: undertaking dimensional surveys of the site; the preparation of designs and drawings for the bases and the equipment cabin; the fabrication of all steelwork required for the installation; the development of a full health and safety plan; excavation and construction of the MEOLUT dome bases; construction of the GEOLUT antenna base; installation of the equipment cabin and generator; excavation of trenches for ducting and installation of the ducting and earth tapes; and full traffic management of the site. Most of the steelwork fabrication was carried out in our fully-equipped, in-house fabrication workshop and is all CE Marking accredited. The new system will provide unparalleled precision and timing, enabling the MCA to respond promptly to any emergency situations and find individuals by their activated distress beacons using the most reliable system on the market today. It also enables the MCA to reliably ignore over ninety percent of erroneous signals which are transmitted by out of date beacons. This was a major undertaking for all involved, and one which will be hugely beneficial to so many people. Obviously, working as the principal contractor came with a lot of responsibility, but credit to the team. They rose to the challenge, overseeing the installation of this state-of-the-art equipment which will save so many lives.